This is a Set of Four Racing Wheels for Pinewood Derby Cars from Pine Car. Retail $5.99 SAVE 25% ! 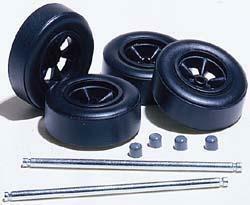 Racing Wheels are the same high quality wheels and axles found in Pine Car deluxe and basic car kits. Includes four wheels, two axles and five hubcaps. Four Racing Wheels for Pinewood Derby Cars. Pine Car has a full line of Pinewood Derby cars and accessories.